"WE ARE HERE TOMOROW TO STAND BEHIND WHAT WE DO TODAY"
Innovation Roofing & Restoration, LLC is a local family owned and operated business, established in 2014. We have over 10 years in combined experience despite that we just opened our doors in 2014, we take pride in our workmanship. We take it very seriously and with respect when it comes to restoring a property after a storm, we treat every single property like it is one of our own. Our roofing crew and project managers are from Colorado and they know what kind of weather elements Colorado has, we will insure that the right roofing system will be installed for your property. 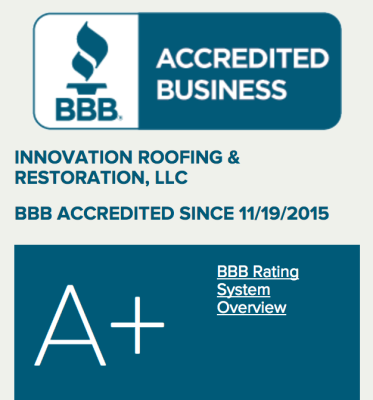 Since we opened our doors, our commitment is 100% customer satisfaction to provide world class customer service and to do exactly what we say (keeping our word) that is what has earned us an A+ with the Better Business Bureau and as a GAF certified weather stopper roofing contractor we can offer manufacturer backed warranties. We live by our motto "WE ARE HERE TOMORROW TO STAND BEHIND WHAT WE DO TODAY"
Our Vision and Mission, is to be Colorado's most respected and trusted Restoration/General Contractor Company. Our mission is to focus on quality innovated workmanship, material and customer service while training and developing professionalism. We will work hard every day to treat our client with respect and with high ethical standards. Loyalty: we will always honor our work backed by our warranties and follow our motto. Honesty: we will always provide our clients with an accurate detailed billing and an accurate detailed assessment report. Integrity: we pledge to have the highest level of ethical and moral standards to our client. Teamwork: we commit teamwork along the way, we will pledge to find the best innovated and quality solution for your project. Professionalism: we pledge to maintain a professional appearance in all business relations. Enthusiasm: it is our pleasure to help our clients safeguard their greatest investment and beautify their property. We believe in giving back; as a proud sponsor, we donate to ChildFund International, Veterans of America and to Churches in our community. Give us a call today for a free hail/wind damage assessment. "We pride ourselves on our diverse portfolio, including projects in restoring properties after a storm providing peace of mind to property owners, new construction, residential and commercial sectors. We believe that building strong client relationships is incredibly important and we work closely with our clients to engender complete trust. We see diversity as our strength, and this has ensured that we've been a contractor practice of choice for more than 3 years. Our team has a great wealth of experience and know that, despite the competition and complexity of the construction process, there should be no mystery to the client. We aim to make our project's and insurance claim's process as clear and easy to understand as possible." Jaime is the president and founder of Innovation Roofing & Restoration along with his wife Lilly as the VP, it is a family owned and operated business. Jaime has a combined experience of 10 yrs.’ in the roofing industry and has over 6 yrs.’ of experience in customer service. As an undergrad in Business Administration Jaime went on working in sales as a commercial sales manager for one of the largest auto parts store in the nation and then went on with dish network T.V. 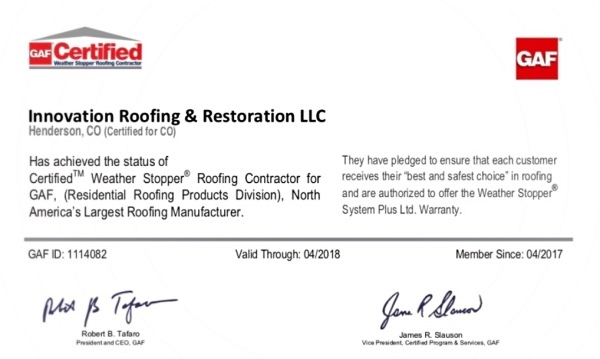 in the resolution team, after joining the roofing industry.. Jaime started installing shingles in 2011 with a good friend he learned to install quality as a priority and to do it right the first time to avoid coming back for the second time. After learning to install he went on to work for a roofing company where he learned project managment skills and the insurance claim process, with his entrepreneurship spirit he decided to venture on his owned to combined what he learned in college and in the customer service field. Jaime has learned the fundamentals of customer service and to always put customers first. As a father of 5 children and a husband, Jaime is dedicated and committed to treat every client with the same values and morals. Luis is the forman and project director for Innovation Roofing & Restoration, LLC. Luis started in the roofing industry since 1997 he has well over 19 years of install expirance in residential and commercial roofing systems. He started working for one of Colorados larges roofing companies in the industry, where he learned the ropes to be a successful and profesional installer and coordinator.